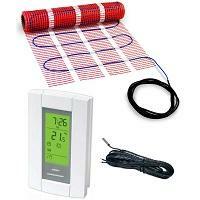 HeatTech mats and mat kits offer simple and cost-effective means of transforming cold, chilly floors into warm and cozy. At only 1/8” thick, the heating cable outputs as much as 42 BTU’s of heat per sq. ft (12W) and is an excellent choice for flooring with good heat conductivity, such as tile and natural stone.